I am about to say something blasphemous. We do not have a video monitor. In an era of more and more devices that constantly report on the state of your children, we say no to anything other than the most basic of information. Frankly, I was skeptical of even needing any monitor at all - we live in an apartment after all. It's hard not to hear things. But I'll admit, it's given me the ability to go down to the basement storage unit when the kids are napping and has been useful in larger vacation homes or in adjoining hotel rooms. It was also good for peace of mind as we nervously moved our first child out of our room when she was a couple months old. Within a couple months of that, however, we turned off the monitor. If she cries/yells hard enough that we can hear her in our bedroom, then she really needs us. Otherwise, I don't feel the need to listen and worry over every whimper. Almost every first time parent I know who has a video monitor ends up watching what I call "Kid TV." Kid TV is when you walk out of your child's room after bedtime and then spend the next hour watching them try to fall asleep. Entertaining as some antics may be, ignorance her has really been just fine for all parties. When I close the door to the nursery at 7:30 pm every night I assume everything is as it should be until 6:30 am the following morning unless proven otherwise. Questions which I blissfully have no idea how to answer - when does my daughter wake up? How long does she take to fall asleep? Anyway, you're a parent, isn't your "to do" list longer than the Oregon Trail (but with less dysentery)? Go eat dinner! Pack tomorrow's lunch! Take a shower! Watch actual TV! Some people will say that they need the monitor to know if their kids are getting out of bed when they're not supposed to. Here's the thing - toddlers aren't subtle creatures. Do you think your 2 year old is actually able to play in the dark quietly (and if that's really the case, ask yourself why you care)? Do you think you won't know your kid got out of bed when they wake up in the morning hugging the dinosaur they took down off the bookshelf the night before? I say that you should make your children's room a safe place (nothing dangerous within reach, safety outlets, bookshelves bolted to the wall) then walk on out of there with a spring in your step. I promise, anything you need to hear you will. Unfortunately there are very few non-video monitors on the market these days. 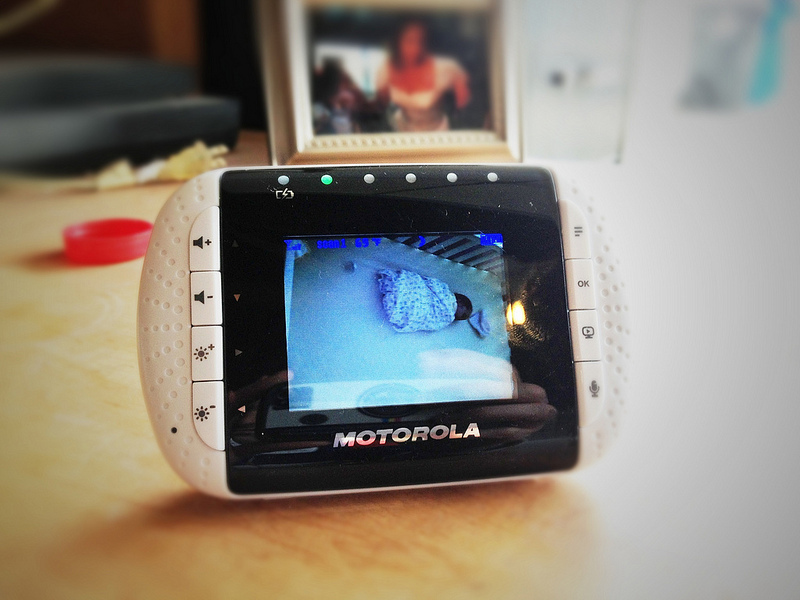 We have the VTech Safe & Sound Digital Audio Baby Monitor . It's sound quality is pretty good, you can buy a kit with a second parent unit, it supports two-way audio (which is nice when a nursing mom needs something), and the audio feed is digitally encrypted (so your neighbors don't get to try out You Radio). We're using it as long as my son is still nursing at night. Once he's done, we'll put it away until the next time we travel somewhere and want to have a drink on the porch after the kids go to bed. Everyone will sleep better for it. Cheers! 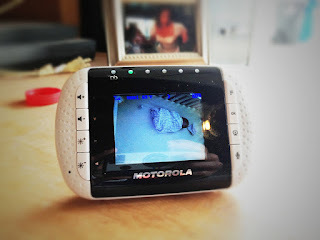 Photo credit: "Through the baby monitor" under a Creative Commons License.